And the duds just keep on coming. I need to escape from the cinema for a while. Enough to keep the little ‘uns quiet for 80 odd minutes but parents might want to take in their Kindles (or a physical book if you’re old school). Astronaut Scorch Supernova (Brendan Fraser) is a national hero to the blue alien population. A master of daring rescues, Scorch pulls off astonishing feats with the quiet aid of his nerdy, by-the-rules brother, Gary (Rob Corddry). However, when the brothers receive an SOS from a notoriously dangerous planet (Earth. What? Spoilers? Come on guys), Scorch rejects Gary’s warnings and bounds off for yet another exciting mission leading to his capture. Inevitably, it’s up to scrawny, risk-adverse Gary to do the real rescuing. Brendan Fraser (The Mummy franchise/George of the Jungle) what happened? Oh how the mighty have fallen. In all fairness, his movie list of late is hardly legendary. He does his best to bring the laughs as chughead Scorch in his strangely Buzz Lightyear-esque attire. It’s a shame with how much talent was attached to this. I know, it’s a kid’s film but Disney, Pixar and Dreamworks (most of the time) have delivered timeless classics with great stories, great characters and enough to entertain everybody. Unfortunately this one just doesn’t make the cut. It’s not all bad. It has enough OTT slapstick gags to keep the little ‘uns giggling and the animation is brilliant. Visually colourful and detailed. 3D hardly a must but there were a couple of clever gimmicky moments in there. Corddry (Hot Tub Time Machine) plays the pathetic protagonist quite well. Ricky Gervais once again pops up in a rather dull and fed up voice over as the computer system, BING, James Bing. Oh dear. Now I’m one for the puns and silly one liners but even that one got me cringing. Jessica Alba surprisingly goes against character type and plays the baddie for a change. William Shatner provides his Trekky gravitas to the sinister General Shanker with aplomb. Sofia Vergara (Modern Family) plays a rather irritating and bland character that really doesn’t have a point or contribution to the film (Bit like Modern Family. Ouch. Stop it). Sarah Jessica Parker does her best with the lines, “Not bad for a mom who’s had two kids”. The characters that stood out for me were George Lopez (Rio/Rio 2) as the slimy slug hybrid Thurman. The ever talented Craig Robinson (This is the End) manages to make a memorable performance as the eccentric fast talking Doc. Steve Zahn (Diary of a Wimpy Kid) hippies it up as alien enthusiast Hawk. His first encounter with Corddry’s character was quite funny but it soon goes on too long and gets very annoying. This isn’t the worst animation film I’ve seen this year. That honour goes to the turkey Free Birds (What?) but it’s pretty close. 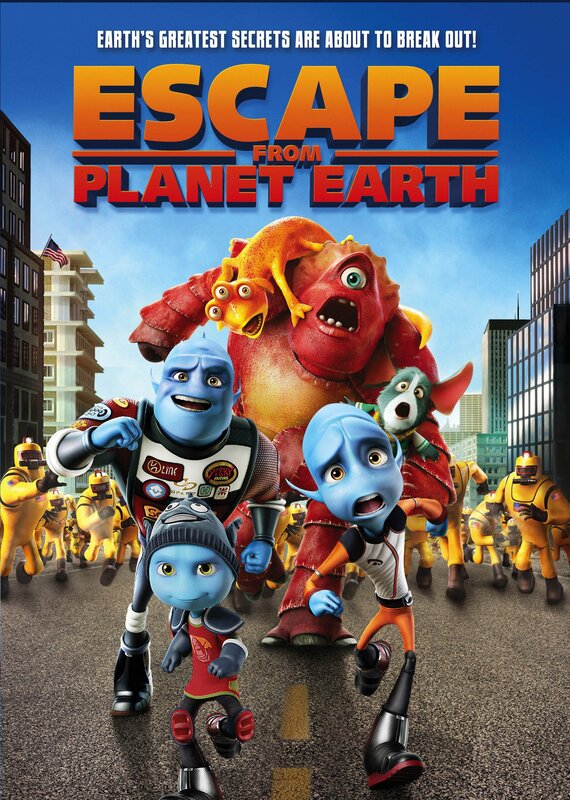 Interestingly enough for those who have seen Free Birds; was Escape from Planet Earth an unintentional spin off? The facility and more importantly, the quarantined Monsters Inc rip off suit guys look just like them. Regardless, they steal the show in one tut worthy guilty pleasure of a scene in which they manage to parody a number of movies in a food fight. The Artist was a nice touch. There is a cheeky pop at satire with the government propaganda video segment, “Do you believe in Communism? Then you are an alien”. Unexpected but not bad. The Beatle-esque aliens got a guilty laugh. The twist *POSSIBLE SPOILER BUT NOT REALLY* that humans have been capturing aliens and stealing their technology and claiming it for their own was a nice touch. Doc venting his frustration at the money he should be earning for Facebook was quite funny. However, it gets all too corny and cheesy. For every good joke, there’s a dozen naff ones. I mean an encounter with a wacky waving inflatable tubed man brought the odd chuckle. But just doesn’t work as a recurring joke. Mainly because it wasn’t that funny the first time round. If you’re looking for a quick distraction for the kids, then give it a go. Otherwise invest in How To Train Your Dragon 2 or something. Was it any good? There’s only one way to find out? FIGHT . . . I mean, review. What the hell did I just watch?! Now for those familiar with the award winning TV Burp, I’m sure you can imagine what to expect. BUT even that wouldn’t live up to your expectations. It is ridiculously stupid, bizarre, random and unfortunately, for most of it, unfunny. Another one to add to the pile of poor TV to film adaptations. There seems to be somewhat of a curse with this transition. The Inbetweeners and Kevin and Perry Go Large being the exceptions. A little harsh and to its defense, its NOT a complete dud, contrary to reviews I’ve read. When it’s funny, it nails it. And I had the odd chuckle. The opening act didn’t give me much hope with a drawn out and highly unfunny mobile scooter race. BUT luckily there was the odd moment to reprieve itself. So what’s it about? 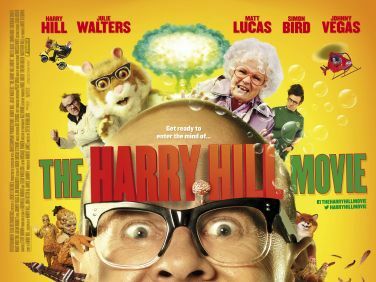 Harry’s pet hamster Abu (voiced by none other than Johnny Vegas. Brilliant!) only has a week to live. So Harry and his nan, played by the legendary actress that is Julie Walters plan to give him the best week of his life by taking him to . . . Blackpool on one of the most trippy and mental road trips I’ve imagined. However, all is not what it seems, as Hill’s evil twin, Otto (played by Matt Lucas) has an evil plan at foot. Silly and just plain daft. BUT there were moments where you just couldn’t help but laugh at the sheer energy and randomness of Hill’s surreal sequences. From the simple task of Harry getting an egg from the chicken coop, it soon becomes a military assault with armed chickens blowing up the back garden?! And Mr. Hill screaming, “I’m henned in”. What surprised me about this film was the sheer number of cameos from a great supporting British cast. Simon Bird (Will from the Inbetweeners) played the dimwitted henchman with aplomb. His creepy Justin Bieber disguise still haunting my thoughts. I can’t believe Julie Walters did this. It was great to see her having fun but I can’t help but feel that this was a step down. And Jim Broadbent?! Playing a cross dressing cleaner in a nuclear power station? Great to see him but I just wish he featured in a better scene. Or a funnier one for that matter. Matt Lucas was wasted as Otto. Apart from his hilarious back story about being raised by a pack of wild Alsatians on the M6, he failed to make a real impression. The Magic Numbers Bed and Breakfast hotel was fantastic. I couldn’t believe that the Magic Numbers, one of my favourite bands, was in this! And a surprise car wash sing song with Shingai Shoniwa, lead singer of the Noisettes, was a treat. For every miss, there is a hit BUT it appears that Hill and the crew soon milk that winning cow until the udders are dry. The angry white van man voice on a Sat Nav was a good joke – “Oi turn left, you toilet!” BUT switching it to Sheila mode, the angry van man’s wife. Yeah, not so much. A drawn out skit with the ancient race of Shell people and Barney Cull (Nope, can’t fight it, BELLY LAUGH!) who are rioting against the merchandise stores for stealing their children featuring the likes of The Mighty Boosh’s Julian Barratt and the lovely Sheridan Smith was so-so at best. BUT the song and dance numbers don’t do anything to hide how dreadful this mad escapade was. Walters burping, rapping and spitting out fire? No, no, no. The Dachshund 5 tribute act with their wearing little afros? Irritatingly adorable! The film didn’t really have a plot or story. It was trippy as hell and nothing really made sense. In a way it reminded me of the old 60s Swinging London British movies that Richard Lester produced. Just watch out for the Brain people and you’ll know what I mean.